The crime map will probably end up being one of the most popular datasets on the site. The set includes incidents from the past 90 days. And while it includes a number of caveats, it does provide an ease of use and level of detail way beyond previous efforts. The map also highlights some of the complications with publicly sharing this type of data. For example: The incidents are pegged to blocks rather than specific addresses in order to protect the identity of crime victims. If anything, the crime data could end up best being used a way for people to get a sense of crime trends in their neighborhood, rather info about specific incidents. Parking is ongoing issue in Albany, and parking tickets have been a source of a drama in the past. So the parking ticket dataset might offer some interesting possibilities for tracking aspects of this issue. Another ongoing issue in Albany is property taxes -- how much, who's paying, and who's not paying. With the data available -- for assessments and payments -- it'll be interesting to see if anyone from outside city government can create new/different angles on the issue. If anything, the website provides an easy platform for the city to share stuff that should have been easily accessible already, like maps for neighborhood associations and APD beat maps. An tiny example of how this makes things better: To create the map of how Albany wards voted on the casino amendment, we needed a certain type of geographical information file to generate the map. But we couldn't find one for the newest set of ward lines. So we had to email someone at city hall for it. Our request was answered promptly and very helpfully. But it was one of those things where everyone spent time that could have been saved. And now the ward lines are online at openAlbany, downloadable in formats for making maps. 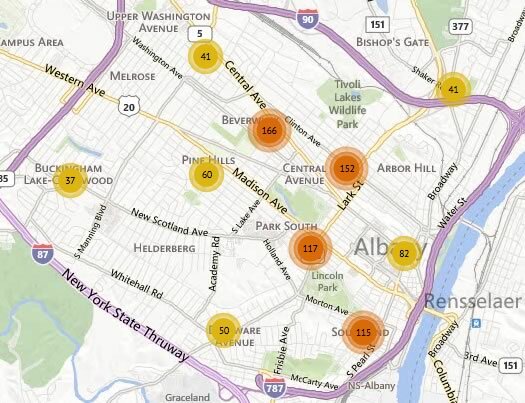 A bit of nerdiness with effects for everyone: It appears that Albany is using the same Socrata platform that the state uses for Open New York. Based on our experience with Open New York, the platform works pretty well from a user perspective. And it makes it relatively easy to sort, filter, and download data in a variety of formats. The fact that this data is easy to download in different formats is very important. Public data is often locked up in formats such as pdf, which like freezing something in a block of ice, accessible only by chipping it out later. The real test of openAlbany will how it holds up over years. Does the city keep adding data? Are the datasets complete and free of (too many) errors? Will people outside of city government make use of the data in helpful ways? But as we've said before, meaningful access to public data is becoming a new civil right in the information age. And openAlbany appears to be a start in the right direction. Seems like a useful tool. ...the parking violation database sure does add a dynamic to the license plate gawking. Am I reading correctly that our mayor makes $33,850 per year? How on earth can she afford to pay the taxes on her residence? @Valerae: That figure is earnings year to date, through March 31. Thanks, Greg. That makes so much more sense. I knew I was missing something! Is it just me or do the fines for parking violations seem completely arbitrary? So many different fines for the same violation..... $25, $35, $40, $50 for "no parking"? Anyone have any insight here? I should probably just keep my mouth shut about this. I get parking tickets and I never pay them on time. About once a year I go to city hall and try to pay them in bulk. I'm disorganized and I lose the original paperwork so I just go in and give them my plate number. They can NEVER find a record of the parking tickets. The "City of Albany Parking Violations" dataset confirms that they have completely lost all my tickets. Now we can all see the racket run by APD and AFD on Albany taxpayers. Police Lieutenants cashing in 40K in OT? Really? With 200 + officers, every PO cashes in between 25/40K in OT? Really? If anything needs to be looked at, this is a good starting point. BTW, I've had enough of "I put my life on the line" stuff...You got the job that you applied for, and it is well compensated considering the qualifications one needs to get it. Get over yourself! The OT alone would close the deficit. @Joe- Are you really suggesting our police officers should work extra hours for free? We'd probably save a lot more in police pay with that policy since most of them would probably quit. I guess we can all just carry guns to protect ourselves, huh? @Mah Every single teacher works a hell of a lot more overtime than that, every year, for FREE! But to the public that's somehow different, because they're not "putting their life on the line." Newsflash: unpaid labor is unpaid labor, period. And last time I checked, sitting in your car outside Bomber's playing on the computer for hours *should not* qualify as "overtime." But in this city, it does! They're working all these hours of *fluff* OT (literally) because they can, because it's allowed. Not because there is some major need. The APD is already overstaffed for a city of this size, they don't need to be pulling extra hours out of their guys to meet some mysterious *need. * They're all working this OT by CHOICE so they can collect massive OT payouts. Who can blame them? The system itself needs to be changed. @Joe You're right, it is a racket, and it's been brought to Mayor Sheehan's attention more than once. Up to this point she refuses to do anything about it. They are the Untouchables in this city.. Go Team Sheehan! Mah, you have the right to your own opinion, but not to your own facts. I did not express either of those things: that they should work extra hours for free, or that we can all just carry guns. It is simply a management issue. Mah, did you know that pensions for police officers and firefighters are based on their last 3 years of pay, NOT salary?